The 30 days or more delinquency rate for April 2016 was 5.3 percent. In April 2017, 4.8 percent of mortgages were delinquent by at least 30 days or more including those in foreclosure. This represents a 0.5 percentage point decline in the overall delinquency rate compared with April 2016. The share of mortgages that transitioned from current to 30 days past due was 1.2 percent in April 2017 compared with 1 percent in April 2016. Serious delinquency is defined as 90 days or more past due including loans in foreclosure. In Alaska, North Dakota the Serious Delinquency Rate increased and Louisiana and Wyoming were flat. All the remaining states saw Serious Delinquency Rates decrease. 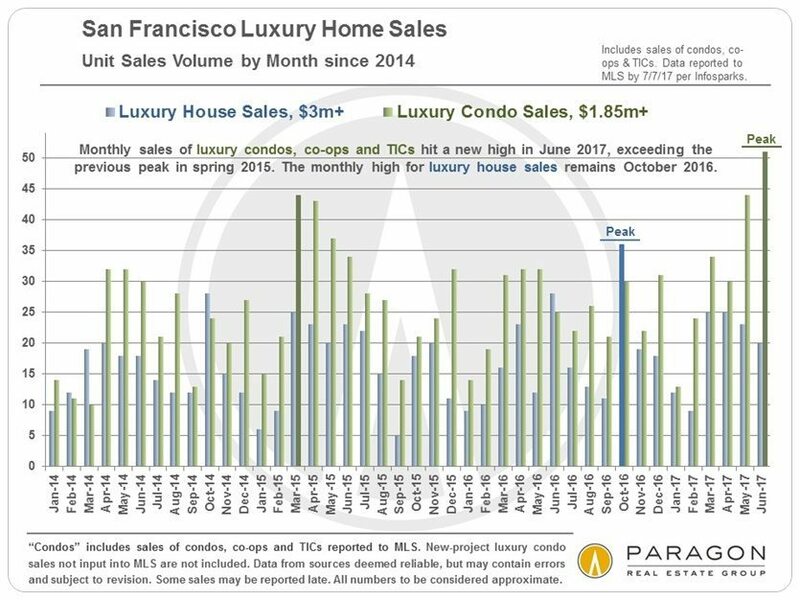 New peaks were reached in San Francisco median house and condo sales prices, and in luxury home sales. 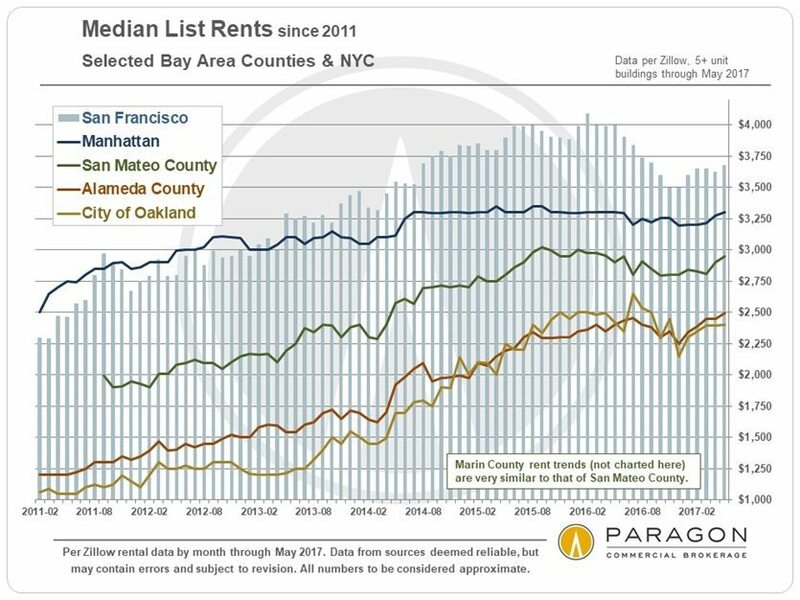 San Francisco rents have fallen year-over-year, though they remain the highest in the country. 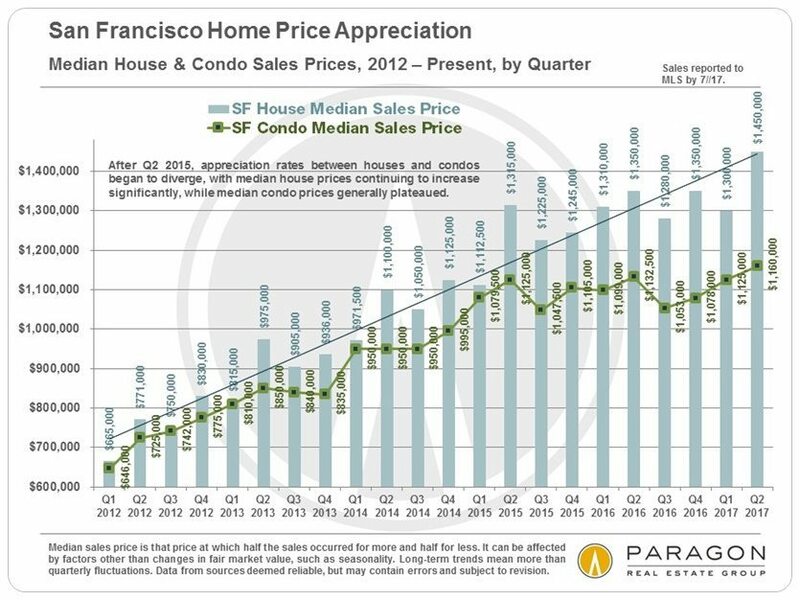 San Francisco hit new highs in quarterly median sales prices for both houses and condos in Q2 2017. The house market has been appreciating much more quickly than condos over recent years. The Q2 median house sales price, at $1,450,000, was $100,000 above the previous quarterly peak. Luxury condo sales hit a new monthly high in June 2017. Both luxury houses and luxury condos hit new quarterly peaks in number of sales, condos by a substantial margin, houses by a couple of sales. San Francisco rents have fallen 8 percent on a year-over-year basis, but remain the highest in the nation. Declining rents is one factor in the cooling of the apartment building market in the city, which is explored in great detail in the full report. View the full residential report online here, and view the apartment building market report online here.